Hull House was founded in 1889 and the association ceased operations in 2012. The museum honoring Hull House is still in operation, preserving history and heritage of Hull House and its related Association. Hull House was a settlement house founded by Jane Addams and Ellen Gates Starr in 1889 in Chicago, Illinois. It was one of the first settlement houses in the United States. The building, originally a home owned by a family named Hull, was being used as a warehouse when Jane Addams and Ellen Starr acquired it. The building is a Chicago landmark as of 1974. At its height, "Hull House" was actually a collection of buildings; only two survive today, with the rest being displaced to build the University of Illinois at Chicago campus. It is today the Jane Addams Hull-House Museum, part of the College of Architecture and the Arts of that university. When the buildings and land were sold to the university, the Hull House Association dispersed into multiple locations around Chicago. The Hull House Association closed in 2012 due to financial difficulties with a changing economy and federal program requirements; the museum, unconnected to the Association, remains in operation. The settlement house was modeled on that of Toynbee Hall in London, where the residents were men; Addams intended it to be a community of women residents, though some men were also residents over the years. 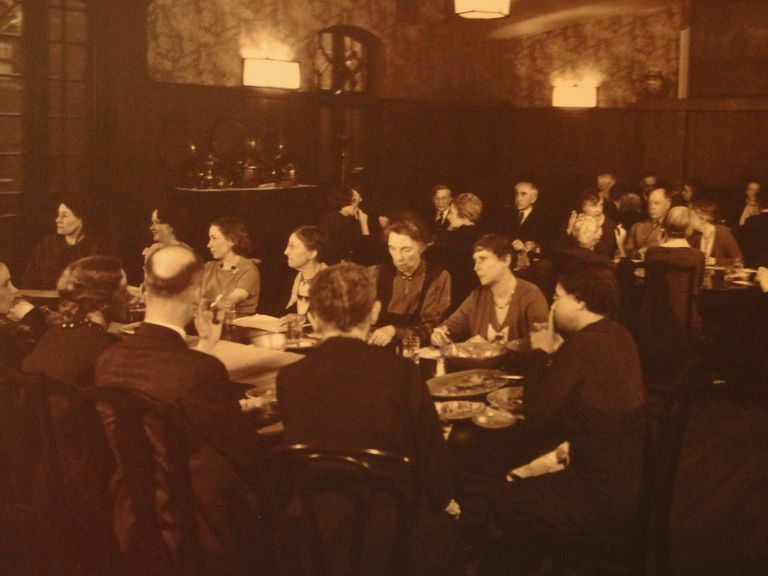 The residents were often well-educated women (or men) who would, in their work at the settlement house, advance opportunities for the working class people of the neighborhood. The neighborhood around Hull House was ethnically diverse; a study by the residents of the demographics helped lay the groundwork for scientific sociology. Classes often resonated with the cultural background of the neighbors; John Dewey (the educational philosopher) taught a class on Greek philosophy there to Greek immigrant men, with the aim of what we might call today building self-esteem. Hull House brought theatrical works to the neighborhood, in a theater on the site. Hull House also established a kindergarten for children of working mothers, the first public playground, and first public gymnasium, and worked on many issues of social reform, including juvenile courts, immigrant issues, women's rights, public health and safety, and child labor reform. Jane Addams: founder and main resident of Hull House from its founding to her death. Ellen Gates Starr: partner in founding Hull House, she was less active as time went on and moved to a convent to care for her after she was paralyzed in 1929. Sophonisba Breckinridge: considered one of the main founders of social work, she was a university professor and administrator at the University of Chicago School of Social Service Administration. Alice Hamilton, a physician who taught at the Women’s Medical School of Northwestern University while living at Hull House. She became an expert on industrial medicine and health. Florence Kelley: head of the National Consumers’ League for 34 years, she worked for protective labor legislation for women and for laws against child labor. Julia Lathrop: an advocate for various social reforms, she headed the U.S. Children’s Bureau from 1912 – 1921. Mary Kenney O'Sullivan, a labor organizer, built connections between Hull House and the labor movement. She helped found the Women's Trade Union League. Mary McDowell: she helped found the Women's Trade Union League (WTUL), and helped establish a settlement house near Chicago’s stockyards. Frances Perkins: a reformer working on labor issues, she was appointed in 1932 as Secretary of Labor by President Roosevelt, the first woman in a US cabinet position. Edith Abbott: a pioneer in social work and social service administration, she taught and was dean at the University of Chicago’s School of Social Service Administration. Grace Abbott: younger sister of Edith Abbott, she worked with the Immigrants’ Protective League in Chicago, and served in Washington with the Children’s Bureau, first as head of the Industrial Department enforcing child labor laws and contracts, and then as director (1917 – 1919 and 1921 – 1934). Ethel Percy Andrus: a long-time educator and principal in Los Angeles, where she was known for progressive education ideas, after retirement she founded the National Retired Teachers Association and the American Association of Retired Persons. Neva Boyd: she educated nursery and kindergarten teachers, believing in the importance of play and children’s natural curiosity as the basis of learning. Carmelita Chase Hinton: an educator known especially for her work at Putney School; she organized for peace in the 1950s and 1960s. Lucy Flower: a supporter of Hull House and connected to many of the women residents, she worked for children's rights, including the establishment of a juvenile court system, and founded the first nursing school west of Pennsylvania, the Illinois Training School for Nurses. Ida B. Wells-Barnett worked with Jane Addams and others of Hull House, particularly on racial problems in the Chicago public schools. Gerard Swope: an engineer who was a top manager at General Electric, and who during the New Deal’s recovery from the Depression was pro-federal programs and pro-unionization.